Photo courtesy of Missouri S&T News & Events. 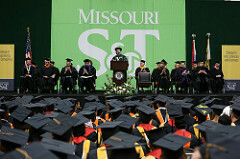 More than 1,200 Missouri University of Science and Technology graduates will be awarded degrees during two commencement ceremonies to be held at Missouri S&T this month. Michael A. Middleton, interim president of the University of Missouri System, will speak at the first commencement ceremony, which will be held at 10 a.m. Saturday, May 14. More than 600 degrees will be awarded during the 10 a.m. ceremony, which is for all graduate candidates and undergraduate candidates in arts, business and science programs. Missouri Gov. Jeremiah W. (Jay) Nixon will speak at the second commencement ceremony, which will be held at 4 p.m. Saturday, May 14. More than 600 undergraduate engineering degrees will be awarded during the 4 p.m. ceremony. Both ceremonies will be held in the Gale Bullman Building, located at 10th Street and Bishop Avenue in Rolla. Middleton, who will speak at the 10 a.m. ceremony, was appointed interim president of the UM System on Nov. 12, 2015, by the University of Missouri System Board of Curators. He previously served as deputy chancellor of the University of Missouri-Columbia and is a professor emeritus in the MU School of Law.